Since the new map came out, a lot of people have been trying it out and it sounds like it's good for KDR and EXP, but I tried playing it once and the game ended before I could figure out what was going on. 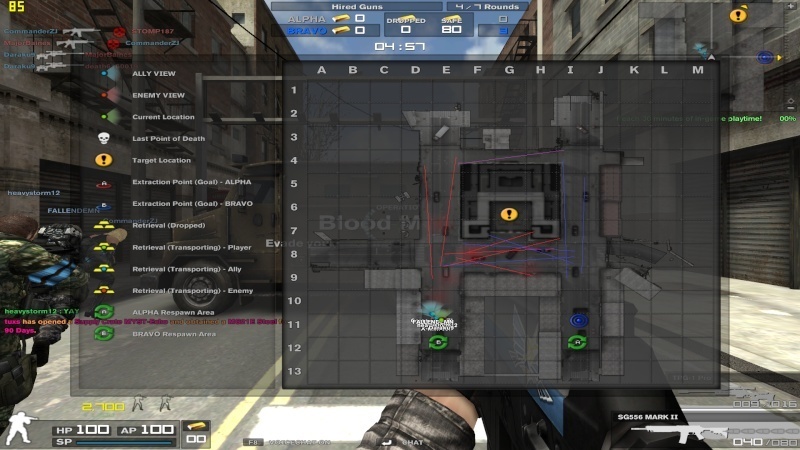 I figured out that each team is trying to acquire the gold and bring it back to their base and you can hire 2 mercs and give them commands, but this is useless without understanding the map. Is someone willing to post a strategy guide and an explanation of the map, since I can't find anything like this on the web? Also, which mercs are the best and in which situations should you use which commands? Being a camper I won't know as much about the strategies as far as mercenaries and such but I can give it a go. As you know the point of blood money is to get the gold back to your base and get kills to earn points. Each kill gets you 100 points and every time you retrieve a gold bar and get it back to your base you get another 100 points. In other words you can either emphasize your strategy on killing people or getting the gold to do well in Blood Money. There are also a lot of things you have to take into consideration while playing in this new mode. This is a picture of the map along with the common camping locations for each team and where they generally shoot at (like usual, red are places where alpha snipers can shoot you from, blue for bravo and purple for both). Obviously you can shoot back at any place that they can shoot you from but these are generally locations that alpha/bravo utilize and use to kill people with the gold/other campers. Just because it is a common camping location it doesn't mean that it strategically good and isn't strategically vulnerable to other positions. There are two back entrances at the back of the bank which can be opened in 2.5 seconds by holding 'E' with your cursor on it. These doors are a very secure way of getting your gold to your base since the alternative would be going through the main door. There is also a panel on the vault that allows you to open it and you can disable the alarm sound by shooting at the red flashing alarm siren just behind the vault door on the ceiling (this will make it easier to hear footsteps). You can see where all the gold the gold is on the map at all times through the map and mini map although you don't get the marker like in CTF mode since that would clutter the screen. Feel free to use this as an advantage to find all the gold and where everyone is. Since a red splotch is left on the map where an ally dies you can use this to determine if an enemy is also after the gold. You can't shoot through most of the glass in the cars/red telephone boxes (all glass in the bank can be shot through though). Most importantly while you can't shoot the glass on most of the cars you CAN shoot peoples's feet under the car although most people are incapable of figuring this out and may call you a hacker. In each iteration of the game there are several stages that determine the tactics that will be used. Rush to bank: At the start of the game people will rush to the bank (most people will go through the back). In this phase snipers will try to hard scope people who are running to the bank. A successful camper will limit the number of people the other team has in the bank all throughout the match and puts the enemy team at a strategic disadvantage. Because of this it is best to hire your mercs after you have gotten behind the building and out of sight from your opponents rater than before since doing it before will give campers ample time to get behind cover and you won't be running with cover from your team mates anymore (if you went through the front it is best to hire the mercs when you start heading back to cut off people who are rushing the safe and because they will go through the front entrance and be easy pickings for snipers since they will stop to shoot). Snipers tend give mercs less priority when sniping since they can tank sniper rounds that aren't headshots and if the person who hired the mercs dies the mercs will stay in place and be easy pickings for the snipers later. During this first phase the front entrance is often naded and smoke can be used to prevent snipers from picking off your players. Opening the vault: Once everyone has gotten in/near the bank (except for the campers) the main strategy is to secure the bank from your opponents and get people in and out of the vault with the gold. Contrary to most game modes mines, turrets, claymore, caltrops ect. is pretty much useless here since the NPCs can set them off and will usually survive more than one of these traps. Out of the mercenaries I have found that 3 different types work the best. The generic male/female merc is best if you want to save money, Mei is the fastest and is the best for fast support if you are in the side allys and need cover or for cover as you are walking back with the gold and Baron is best used as a turret to whittle down the health of opponents or distract them because he is so tanky. Most of the time you just want to leave your mercs near by where you are and possibly in the safe and other places that you may need cover. Don't spend too much time setting them up for good camping spots since they can easily be killed and since your opponents can quickly launch a counteroffensive because the bank is relatively close to the spawn points. Laws and all other forms of ranged explosives are very important here because they can cause a lot of damage without putting you in too much risk. Cashing in the gold: Each gold bar after 10 will hinder your speed by 3%. The number of gold bars you pick up us up to you but you should get as many as you think you can get away with (less if your team is getting owned by snipers and more if your team is owning). Fire and poison gas is useful in preventing people from escaping with the gold from certain corridors (since they all tend to go the same path) and smoke should be used to prevent snipers from hard scoping people with the gold. Once you are near your base and have gold feel free to pick up more gold if your ally dies since you can't unstack gold so if an enemy tries to run away with the gold they will be severely hindered by the increased weight that you have added (you might not want to do this if your opponents have good campers). Mercenaries should be used to deter opponents from rushing your spawn and campers may want to buy them too even if they aren't going to be moving from cover much. At this point in the game it is VERY important to look at where the dropped/picked up bars of gold are from the map and count the gold that nearby allies have so you can determine if gold that your opponents have will potentially make you loose the game. If they do then you will have to try to lead a counter offensive without putting your gold carrying players at too much risk. If you are doing well at camping you may want to have the person with the game winning bars of gold (the game will end if all 80 bars are returned to the spawn points or when the timer ends) and camp your opponents. Although you should buy mercs freely you will need to pace yourself throughout the rounds if you find that you start going into deficit.